The sun and its abundant solar energy serve myriad functions in our daily lives, whether it is circulating air, heating water or supporting plant growth. If we conduct a study of existing technologies on solar energy, we find that the most prevalent uses of the sun’s energy are heat and electricity generation. In other words, we are trying to replace conventional sources of heat and electricity, like coal, petroleum and natural gas, with a renewable, cheap and abundantly available source – the Sun. Among the various solar technologies such as photo-voltaic, thin film, CPV, etc, concentrated solar power in India is the least prominent in power generation. 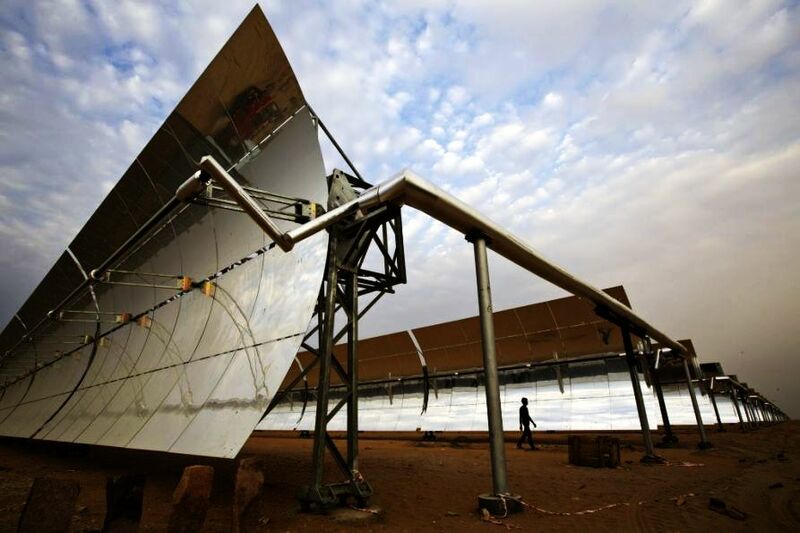 As the name suggests, the concentrated solar power (CSP) technology accumulate heat from the sun’s rays to a particular point for heating water, oil or other material. 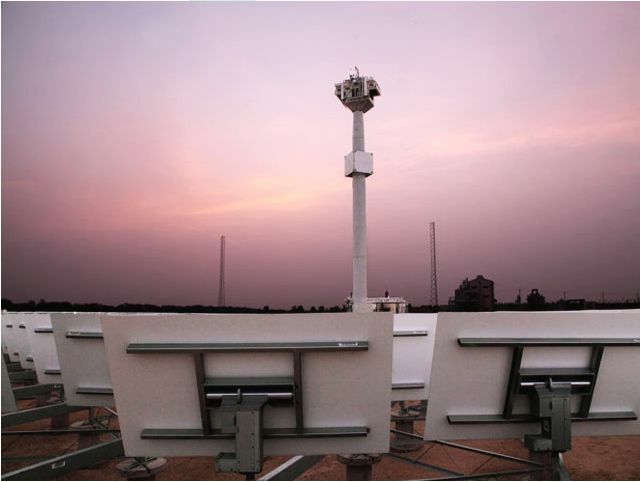 CSP works by concentrating sun’s rays on a small area, which would otherwise be distributed over a larger area. This small area can contain water flowing through pipes or other fluid (gas or liquid) containers. Molten salt is considered the best fluid, since it can retain heat well, which can be used at a different time. So even during cloudy days when heat cannot be generated directly from the sun, the molten salt can emit heat to produce power. The heat-to-power conversion technology is often used in power plants that generate electricity through steam turbines. Water is heated by the solar heat to convert it into steam, which then drives a turbine that generates electricity. Generally in large power plants, coal is burnt to derive this heat, since it has the ability to generate tremendous amount of heat. So instead of coal, CSP is used to decrease the harmful effects of using coal, like air and land pollution. The parabolic trough system contains a large, U-shaped parabolic focusing mirror. When sunlight falls on it, the mirror reflects the light toward a pipe fixed at the center, which has been blackened to increase the absorption efficiency. The concentrated sunlight and blackened pipes together contribute toward heating the oil inside the pipe to as much as 350°C. This hot oil then flows into another pipe to heat water which is converted to steam, in turn driving the turbines that generate electricity. Since this technology was the earliest to become commercially viable, it is easy to obtain information and manufacturers for parabolic trough systems. The main disadvantages of this system are that trough systems occupy a large area and parabolic mirrors are quite costly to manufacture. 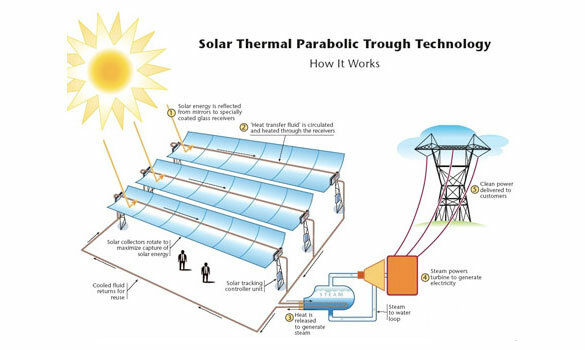 The parabolic trough system has been used by Godawari Green Energy Ltd, India’s first solar thermal power plant built under the national solar mission. The power tower system uses flat mirrors called ‘heliostats’ that turn along with the sun’s position in the sky in order to reflect as many rays as possible throughout the day. Many such mirrors are placed around a tall tower, the ‘receiver’, which has a big container of fluid, like molten salt to be heated. The sun’s rays are accurately concentrated by these mirrors on to the container, raising the temperature up to 500°-1000°C. This technology has overcome some concerns of cost, since flat mirrors are cheaper than parabolic mirrors. While power towers can be more efficient in energy storage, this system needs an extremely large and flat area for efficient heat generation. A modular power tower solar CSP system has been utilized by ACME Solar Energy Pvt. Ltd to build its 2.5MW power plant in Rajasthan. 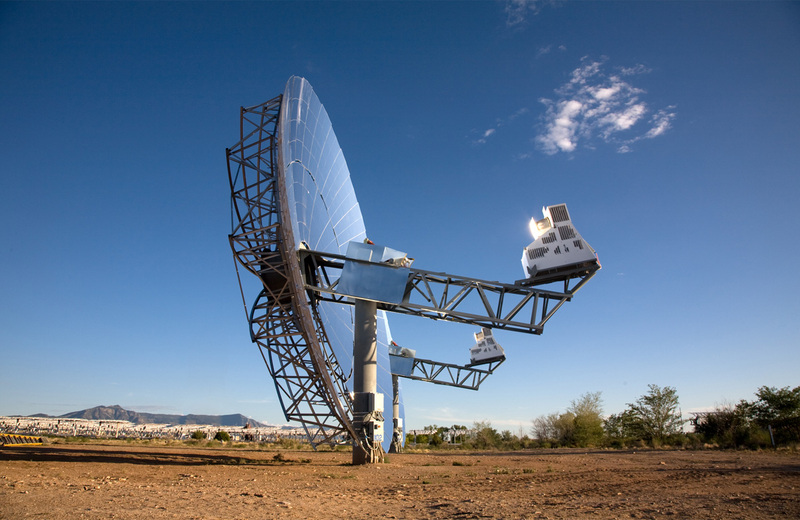 The Dish Stirling system uses bowl-shaped or dish-shaped mirrors that look like the satellite TV dishes at home, but they are about 10 times larger. Similar to the trough system, these dish mirrors concentrate the sun’s rays to a focused point located at the centre above the mirror’s surface. However, there is a complex receiver at this point, which absorbs all this concentrated energy and runs the Stirling engine that has gases like hydrogen or helium. After receiving adequate amounts of heat, these gases expand to move the engine’s piston, much like the engine in cars to generate electricity. In order to increase the machine’s efficiency, the mirrors track the sun’s position in the sky to capture maximum energy. The main advantage of this stand-alone system is that it occupies minimal space. This system provides the highest solar-to-electric efficiency of around 30-32% and is modular enough to reduce the number of complex steps involved for obtaining electricity. However, the high cost of the Stirling engine has deterred commercial applications in India till now.